For Star Wars fans, this past weekend’s Celebration in Orlando, FL was a treasure trove of insider information, a glimpse of the future, and a heavy dose of nostalgia. While it might still take some time to unpack all of the great moments, the highlight was easily the debut of the first teaser for Star Wars: The Last Jedi. With a little more than half a year before the film hits theaters, anticipation was high for a proper look at the movie. So far, the project has been veiled in more secrecy than even The Force Awakens was two years prior. Now, the marketing push will kick off in earnest, giving us new insight into the upcoming film. While we wait, fans have been eagerly dissecting the short teaser for any clues as to the future of the franchise. 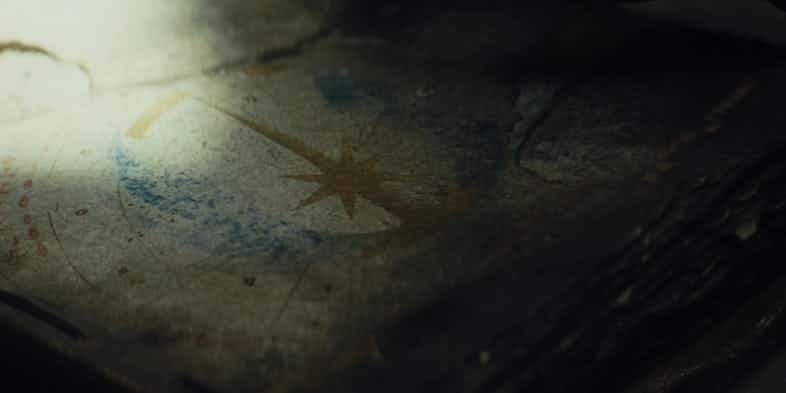 One particular moment that has the Internet buzzing is a shot of the Jedi Order’s logo on an old book. Appearing to be in Luke’s possession, fans are already declaring it to be the fabled Journal of the Whills. While its identity is still unknown, there’s plenty of evidence that the Whills, once relegated to the Expanded Universe, will make a proper debut in the new Star Wars canon after being teased for years. But just what is the Journal of the Whills, and what does it mean for the future of Star Wars? Despite being one of the oldest bits of Star Wars lore, there’s not much definitive information on the Whills. Back when George Lucas was crafting the script for the first film in his trilogy, he imagined them as stories recorded by an ancient race of immortals. 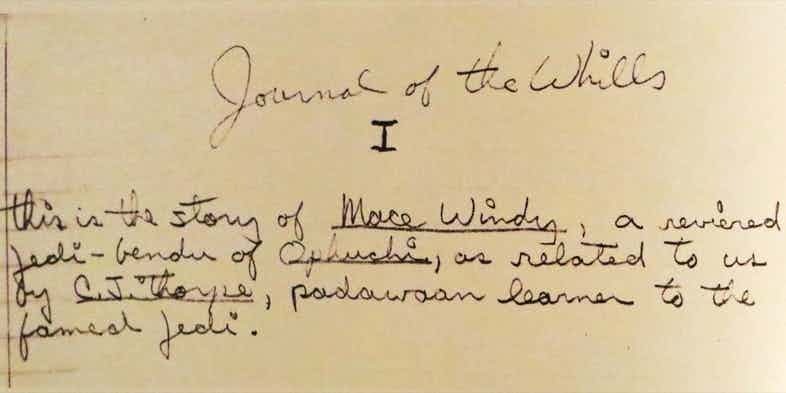 Known as the Whills, they would pass the knowledge they gained on to chroniclers who would put them into journals. In the story, Lucas imagined R2-D2 would be one of these Keepers. He also at one time imagined that he’d be one himself, and in this way could connect the story of Star Wars to our own reality. In the end, Lucas phased out mention of the Whills and turned the idea into the Force. One vestige remained, however, in the form of the opening crawl. These recaps of events were meant as versions of entries into the Journal, and were being told to the audience by the Whills. This is further hinted at in the usage of the phrase “A long time ago in a galaxy far, far away,” setting up the possibility of the events of Star Wars happening somewhere in our own universe. Over the years, ideas of the Whills were peppered throughout the Expanded Universe, and hints were given in behind-the-scenes materials for the prequels. The concept almost appeared in the Clone Wars animated series, but was later abandoned. Then, with the novelization of The Force Awakens, the Journal of the Whills was finally mentioned in the new canon during an opening quote. By including the passage, the Whills were finally made canon and their religious themes were brought to the forefront. 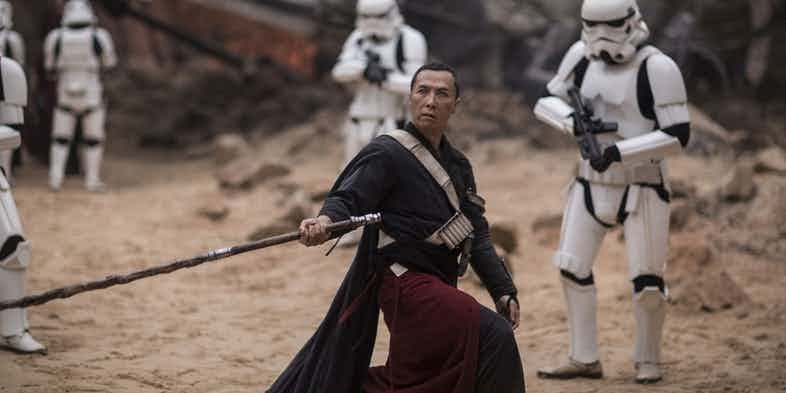 Last year, Rogue One made the Whills an even more explicit part of Star Wars by introducing Chirrut Îmwe as a Guardian of the Whills. When we meet the blind warrior, he and his companion Baze are said to be former acolytes from the Temple of the Whills in Jedha City. 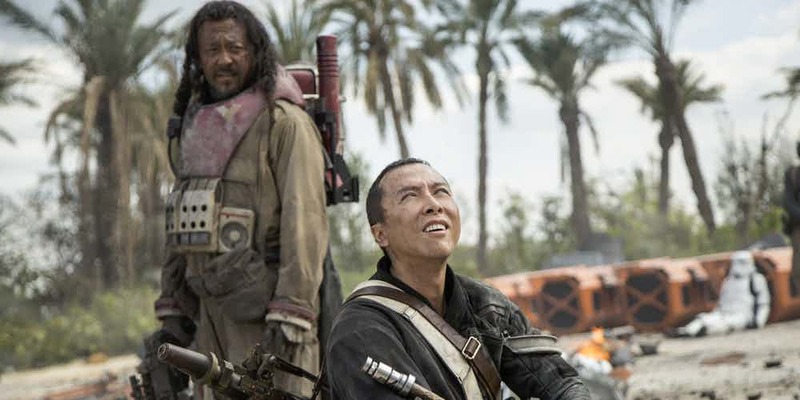 Thanks to tidbits of knowledge from the movie, its novelization, and a new book centering around Chirrut and Baze, we have a better idea of the who the Whills are. While the Guardians weren’t Jedi, they worshipped the order and their power. Many, in fact, were Force-sensitive themselves, and had an affinity for the Kyber crystals that came to the planet long ago. Eventually, those crystals would power both lightsabers and the Death Star. As a Guardians of the Whills, Chirrut’s role is still somewhat unknown. It’s likely, however, that his purpose is to preserve knowledge about the universe and the role of the Force in all things. In doing so, the early ideas that Lucas had for the Whills are kept alive and integrated into the Force-focused world that became Star Wars. Considering how much the Whills have been referenced in Star Wars lore in the past few years, it makes sense that they’d eventually get a larger role in the movies. While there’s no way to confirm the book seen in the teaser is the Journal, it makes sense. And even if it isn’t the exact book, it could be something similar. Another shot in the trailer also highlights the old books Luke has, with the one Rey touches being specifically highlighted. Even if it isn’t the Journal, it’s clear it’s an ancient book having to do with the Jedi. It’s also important enough to factor into at least one scene in the movie and two shots in the first teaser for the film. Considering Luke’s journey over the past few decades, and ominous declaration at the end of the teaser, he’s clearly been doing lots of research on the Force and the Jedi. As such, the book could be the Journal of the Whills, or simply his collection of knowledge on the Force. Either way, it adds up to much the same thing and will likely be packed full of knowledge that’s long been relegated to Expanded Universe material. The Force has been strong these past few years. The animated series Star Wars Rebels and The Force Awakens have both been huge hits for Lucasfilm and Disney, and a never-ending stream of comics and novels have helped to flesh out the all new canon of the Star Wars universe. Meanwhile, Rogue One: A Star Wars Story has proven that a standalone film set in the galaxy far, far away can be every bit as successful as the movies focused on the Skywalker family. Rogue One has already made half a billion domestically and joined the $1 billion club globally thanks to massive approval from fans and critics alike. Meanwhile, connections between the movies and other media continue as Rebels makes more and more connections to Rogue One. Saw Gerrera has already popped up on the series (voice by Forrest Whitaker) and there’s a good chance some of the other characters from the film could follow suit. It looks as if Lucasfilm has no plans on slowing down either. 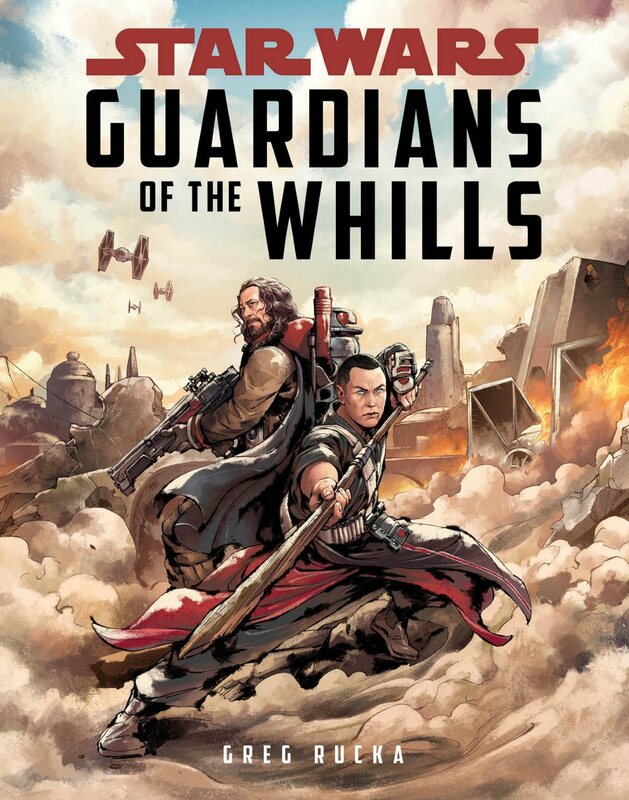 The upcoming book titled Star Wars: Guardians of the Whills will focus on Chirrut Imwe and Baze Malbus. The book is written by bestselling author and comic book scribe Greg Rucka, known for his work on Black Widow, Elektra, and Daredevil. Though the book is aimed at young adults, it will still likely appeal to many Star Wars and Rogue One fans. The Whills is one of the deepest aspects of Star Wars lore and Rogue One marked its first mention on screen. Not only does it connect Chirrut and Baze to the Jedi and Force, but also to A New Hope and the other films as the opening crawls are all based on journals from the Whills. Though this part of the canon has been fleshed out plenty in older tie-in media, it’ll be interesting to see how it fits into the new mythology. As the Guardians of the Whills are essentially a religion built around the Jedi, diving into Chirrut and Baze’s past will likely shine a lot of light on the lore connected to the Force, the Kyber crystals that power the Death Star and lightsabers, and what the temple on Jedha was once like. The book will also be intriguing as it will fill in the story of two of Rogue One‘s most mysterious characters and how they connect to Saw. 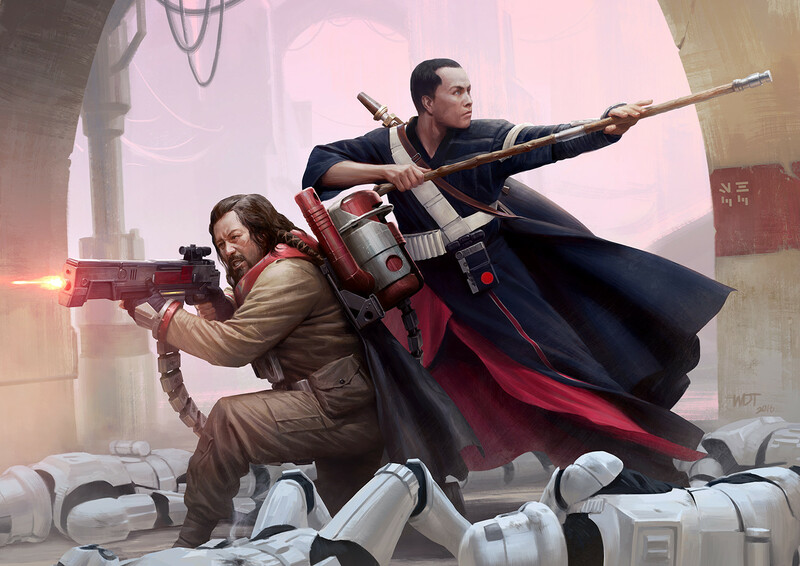 Hopefully, we’ll see the Ghost crew interact with Chirrut and Baze on a future episode of Rebels, but the upcoming book looks like it will be both fun and informative.